There’s a lot of talk in sales about reaching out to a level of high-ranking executives—CEOs, CFOs, CIOs—known as the “C-Suite.” But much of that talk is cheap, especially when it comes to reaching those executives in a way that produces sales results. Find out what works and what doesn’t with sales emails + getting replies. Then you have the expertise of two men, Nicholas A.C. Read and Dr. Stephen J. Bistritz. To say they wrote the book on the C-Suite is literal, as their volume “Selling to the C-Suite” reveals the thinking and strategy that goes into reaching for the top when selling. Bistritz, the current head of SellXL, remembers well the moment he heard a startling executive-level insight. In 1995, he was crafting a workshop on selling to executives by conducting research at Hewlett-Packard. This lies at the heart of the C-Suite philosophy: getting to the level of becoming that trusted advisor. But as you might’ve guessed, it’s hardly a matter of making a cold call to a CEO. The area where capability and integrity rise together is what’s known as the “Client Value Zone,” which Bistritz adapts from the book “Clients for Life” by Jagdish Sheth and Andrew Sobel. The relationship between salesperson and client becomes collaborative, and the salesperson moves from a traditional role into something special. To a large extent, it’s also whom you know. 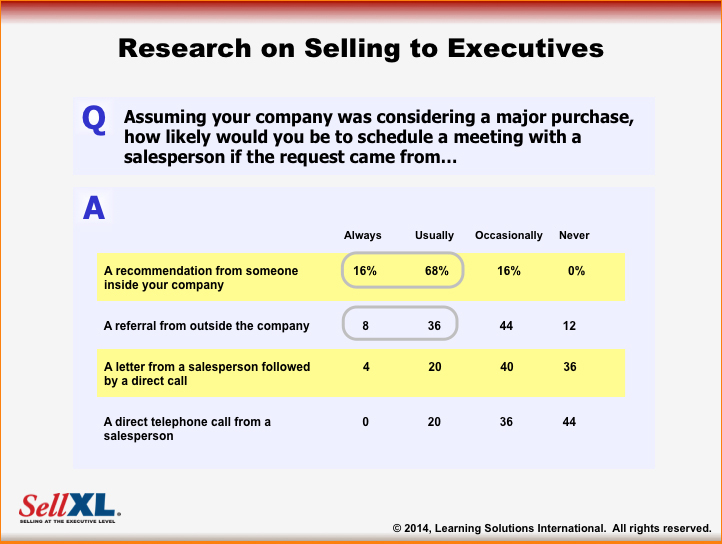 Bistritz (who has the benefit of drawing on numerous studies from more than 500 executives), asked executives how likely they’d be to schedule a meeting with a salesperson concerning a major purchase. If the recommendation came from someone inside the company, 16% said “always,” and 68% said “usually.” With outside referrals, it was 8% always, and 36% usually. 2) Know something about that executive’s line. “Typically when you look at a client organization, there aye two types of buying decisions taking place: The formal decision, and an informal buyer who can usurp that buying decision at the last minute,” Bistritz says. If you’ve done your homework and know who that informal buyer is, you can preserve the deal.